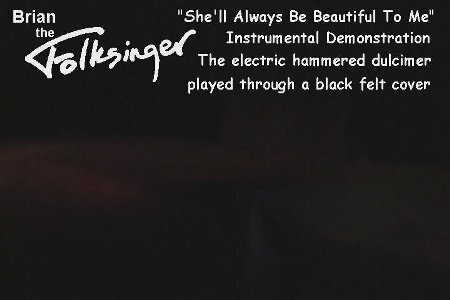 In the natural progression of this series, I use a real song for an example, choosing "She’ll Always Be Beautiful To Me" for the third time, for simple comparison to other versions, and because it is a good example of one type of playing style, a fluid and melodic composition. I also use my heavier black felt this time. The effect is more pronounced, and demonstrates the use of a visual effect again, like the original use of the studio lighting. Visual effect is also the reason I wrap the heads of the hammers in white tape when I pad them, instead of black tape, so they stand out and add both a simple visual effect, and also a visual reference to the music for the audience. Especially in video, everything disappears except my hands and the heads of hammers. I’m throwng a small bright blue spotlight across from my left just to illuminate the hammer heads, you can see it reflected in the edge of the left pickup. The effect is not an accident. This entry was posted on Wednesday, April 28th, 2010 at 5:14 am	and is filed under The Electric Hammered Dulcimer. You can follow any responses to this entry through the RSS 2.0 feed. Both comments and pings are currently closed.